Could California’s next nuke be on the horizon? Backers of a new Fresno “clean energy park” aim to use nuclear power to clean up salty irrigation water in California’s Central Valley. They see the state’s 35-year-old moratorium on expansion of nuclear power as a mere speed bump in the road. They wouldn’t be the first. There have been several attempts to challenge the ban over the years – in the courts, in the legislature, and even a couple false starts through the initiative process. But the idea of simply drawing up plans for a plant and gearing up to build it – without getting permission from the state – that’s a new approach, which I explain in my Wednesday radio feature for The California Report. Fresno Nuclear CEO John Hutson told me he thinks it would be much more profitable to sell precious clean water to farmers than to generate electricity for the grid. “Why should we sell electricity when we could clean enough water to irrigate 40 thousand acres of Thompson seedless grapes?”, Hutson asked. He also plans to make water bottles out of the captured salts and fill them with fresh, desalinated water. I wonder how many of those he’d have to sell to finance two 1600-megawatt reactors? KQED’s Quest first talked to Hutson several years ago about his plan to build a nuclear plant next to a Fresno wastewater treatment plant. At that point, he was talking about selling electricity and possibly introducing a ballot initiative to overturn the moratorium, enacted in 1976. Meanwhile, some of the state’s anti-nuclear activists are pushing in the other direction. They hope to collect signatures for a proposed ballot initiative which would expand the current moratorium to the point of shutting down power generation at the state’s two existing nuclear plants. The initiative’s author, Ben Davis, told me he’s not quite ready to knock on doors yet. He sent a letter to the state Attorney General’s office voicing concern about the state’s summary of the proposed initiative. He doesn’t like the clause that predicts a full nuclear stoppage could cost Californians billions of dollars a year due to electricity interruptions and rate increases. “It misleads the public,” Davis said. “It’s written as if they handed the proposal to the nuclear industry and asked them to write whatever they wanted.” And he wants the summary to include a more specific estimate of what a nuclear disaster like Fukushima could cost the state. pollution by this date if not sooner. Cal;ifornia should reject nuclear power, both the new and the old, and embrace real clean energy solutions. 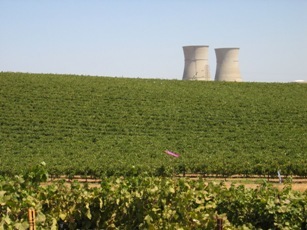 Current CA law specifies that nuclear power plants are banned until there is a solution to the problem of nuclear waste disposal. That is still a problem. However, what no one has taken into consideration is the ecological effect of the work required to get process uranium to the plant in the first place. Since Dr. Raymond-Whish reported on the relationship between uranium and breast cancer, (http://www.nau.edu/gradcol/enews/2008September/Research.html) has been ignored, I would suggest that anyone proposing new nuclear facilities be willing to relocate their families to the Navajo Reservation and there to drink the water. It might be appropriate since the Fresno Scam claims to want to use the facility to clean up Central Valley water. As you’ll hear in Sasha’s radio report, Fresno Nuclear investors believe they have a way around (or through) the current moratorium. Not everybody agrees. Nuclear Power was a mistake and remains a mistake. If the human family survives it, our descendants will wonder what we were thinking to justify leaving them nuclear power’s toxic legacy — a legacy they will be dealing with for hundreds if not thousands of generations. And even if an insurance company did guarantee its safety, what is their guarantee worth? What could they do to protect us and future generations if San Onofre’s spent fuel storage pond lost its coolant water. If this happened an almost unquenchable radioactive fire would spontaneously erupt, spewing radioactive materials wherever the wind blew for weeks if not months — rendering Southern California a dangerous place to live for thousands if not hundreds of thousands of years. Taxpayers for Common Sense, Public Citizen and the Congressional Research Service say that the recently passed 2005 Federal Energy Bill includes “a taxpayer liability of $14 to $16 billion” in support of nuclear power. If nuclear power is so safe and wonderful, why does it require the Price Anderson Act? The Price Anderson Act puts taxpayers on the hook if the cost of a major radioactive release exceeds $10.5 billion. According to a Sandia National Laboratory analysis, this puts taxpayers on the hook for over $600 billion to cover the damage that a serious radioactive release would cause. Another Sandia Laboratory study focusing just on the Indian Point nuclear power plant in New York, concluded the damage caused by a serious release from that plant could cost up to a trillion dollars. Needless to say, any serious radioactive release from any U. S. plant would wipe out any net energy gain by nuclear power if — there ever was one. Realizing the potential cost of a serious radioactive release, manufacturers, insurers and utilities, were unwilling to build, insure or order plants. They only got seriously involved after the Congress assigned these cost to the taxpaying public. On page 7 of a report by the Institute for Energy and Environmental Research titled The Nuclear Power Deception, they included the following 1996 quote from then NRC Commissioner James Asselstine, “given the present level of safety being achieved by the operating nuclear power plants in this country, we can expect a meltdown within the next 20 years, and it is possible that such as accident could result in off-site releases of radiation which are as large as, or larger than the released estimates to have occurred at Chernobyl.” Bare in mind, a meltdown is only one of several things that could happen with nuclear power to cause a serious radioactive release. As I said in the beginning, nuclear power is a mistake. Especially considering we already have all the technologies and know-how needed to make us completely and abundantly renewable electricity self-sufficient with out nuclear power. As a bonus, solar energy leaves no radioactive residues for our children or future generations to deal with. Additionally, although not completely environmentally benign yet, solar energy collection systems can be designed to last generations, be perpetually recyclable and leave zero toxic residues behind. If San Diego County covered 24% of its roofs and parking lots with 10% efficient PV panels, it would produce more electricity than the county consumes. This assumes that 3 million resident use, on average, 10 kWh per capita per day after installing cost-effective electricity use efficiency improvements. For details watch my videos and read my free books and articles at http://www.jimbell.com. The books and articles can even be printed out for free.